Over the past decade, there has been growing recognition of the societal, human and financial costs of mass incarceration. This is particularly true in Los Angeles County, where more than 17,000 men and women comprise the largest jail population in the nation. Recognizing the implications of managing a system of this magnitude, L.A. County is working to be at the forefront of efforts to reform the criminal justice system and reduce recidivism. “There’s a national conversation around mass incarceration and how it has failed to produce the results that were promised,” said Otto Solorzano, Chief Deputy Director at L.A. County’s Department of Workforce Development, Aging & Community Services (WDACS). These efforts took on greater urgency in 2014 after a statewide ballot measure downgraded certain property and drug crimes from felonies to misdemeanors. Thousands of people in L.A. County became eligible for re-sentencing or release from jail after the new measure passed. For those facing a wide array of challenges upon reentry to their neighborhoods, L.A. County officials recognized the need for a comprehensive plan that would include job training and placement, housing, and access to healthcare. In light of research showing that individuals who have jobs are less likely to go back to prison, L.A. County has focused on making sure that those who are newly released from jail have access to sustainable employment opportunities. FUSE is currently working with L.A. County on two projects to help ensure that people emerging from the criminal justice system are successfully reintegrated back into their communities. Working with WDACS, FUSE fellow Casswell Goodman is developing a holistic strategy that builds on the L.A. Rise model, an approach that uses partnerships with social enterprises to create a pathway from unemployment to permanent work. Goodman is evaluating the landscape of workforce development activities designed for reentry populations, identifying gaps and job-related opportunities, and creating a plan that coordinates the various programs and stakeholders. As part of their fellowship projects, Casswell Goodman and Alex-Handrah Aimé are creating a media campaign to destigmatize justice-involved individuals in order to help them reintegrate into their communities. Goodman collaborates with FUSE fellow Alex-Handrah Aimé, who is working with WDACS to increase hiring of this population by enhancing business engagement tools and developing marketing strategies to target major regional employers and industry sectors. 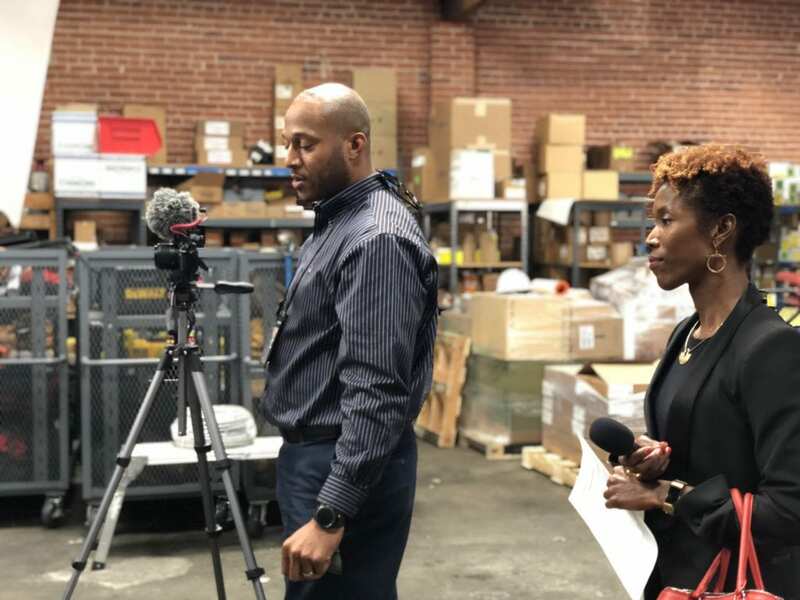 To understand the sheer scope of the challenge, Goodman and Aimé have collectively conducted more than 100 stakeholder interviews with L.A. County officials, employers, and leaders of social enterprises, community-based organizations and NGOs. That engagement has laid the groundwork for more effective communication between the various players, which had previously been one of the biggest barriers in coordinating their efforts. Given the scope and urgency of L.A. County’s criminal justice reform efforts, that collaborative approach is essential. “No organization alone can solve these issues,” Solorzano said. L.A. County is emerging as a model for how criminal justice systems can be reformed to focus on rehabilitation instead of punishment, but that kind of cultural shift doesn’t happen overnight. Goodman and Aimé are piloting a media campaign aimed at removing the stigma associated with reentry populations to a variety of audiences, including even L.A. County employees. “Some people have worked for the county for 40 years. If you’re brought up in a system where the paradigm was punishment-focused, it’s really hard to turn that on its head rapidly. The shift is ensuring trauma-informed empathy, a focus on rehabilitation, and to assist the clients in the positive transformation of their lives,” said Aimé. As part of the strategy, Goodman and Aimé will release a series of videos that portray Los Angeles residents who have been “justice involved” — those who have been involved in the criminal justice system. The idea is to destigmatize and humanize these men and women to a broad audience: potential employers, local communities, as well as those who work within the criminal justice system. One video simply shows a person’s portrait, name, the person’s current occupation, and after a few seconds, the number of years he or she served. It’s a moment of revelation for viewers to see that ordinary residents living full and productive lives have been justice involved — that it could be any one of us. Another set of videos shows Angelenos who have successfully reentered the workforce talking about what it took for them to succeed. In one video, for example, they feature a solar panel technician named Darean Nguyen who had been in and out of jail for most of 20 years. Nguyen said after his last stint in jail serving a six-year sentence, he was motivated to break the vicious cycle. While in his cell, a librarian happened to give him a textbook about solar technology. “At first I didn’t think much of it. Then I read it and thought, ‘Okay, wow, this is something I’d probably be interested in and look forward to,” he said. Three years later when he was released, Nguyen ran into an acquaintance who told him about Homeboy Industries, which offered free solar technician training through the East L.A. Skills Center. 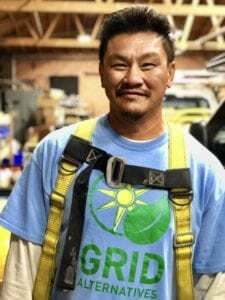 Nguyen completed the training and has since become one of the lead trainers at GRID Alternatives, which works to train underserved populations to become involved in clean energy enterprises. In the coming months, Goodman and Aimé are also working to launch a website that provides an intuitive way for justice-involved individuals to access social, health, and workforce training services whether provided by L.A. County or local, community-based organizations. Part of L.A. County’s vision for reform involves addressing barriers to reentry earlier in the process, while people are still in the system, rather than waiting until after their release. “We have a lot of conversations about how to reduce barriers within the criminal justice system,” Solorzano said. For example, L.A. County is piloting a program that provides inmates with job training while they are still incarcerated. A prolonged period of unemployment increases the likelihood of recidivism, so minimizing that lag time is critical. Another priority is ensuring a continuity of care once an individual has left the jail system. “We’re doing a lot of discharge planning within the county jail for people who are reentering,” said Peter Espinoza, Director of the Office of Diversion and Reentry, who was a Los Angeles Superior Court judge until 2016. This work includes making sure that individuals leaving jail don’t lose access to prescription medicines, mental health services, or substance abuse treatment, and that they have referrals for housing and employment services prior to release. These types of upstream interventions can increase the likelihood of successful reentry for people like Nguyen by creating a more stable jumping off point to transition back into the community. Until such a comprehensive system can be developed, however, the two are working to provide support to a Probation Department-led reentry center, which is scheduled to open in 2019. L.A. County recognizes the value of creating a community center that provides a holistic set of services — including mental health, workforce training, a food pantry, and other assistance — for those who are under supervision, as well as for their families and the broader communities into which they’re reintegrating. To that end, Goodman and Aimé are taking a systems-based approach, which means designing solutions that address not just the needs of individuals, but that also consider the ways in which the system as a whole has discouraged or otherwise blocked the path for those who are reentering, especially for people of color. It’s an ambitious vision for justice reform and one that confronts the overlapping forces of race, poverty, homelessness, substance abuse, mental illness and joblessness that create a revolving door into the criminal justice system. “The Board of Supervisors has been the driving force behind this effort. When political leadership is behind an initiative of this magnitude, then we feel supported to experiment, to figure out ways to make things happen,” said Solorzano. Given that Los Angeles is home to the largest jail systems in the country, successful reform here could represent a national model for best practices in reducing recidivism. Ultimately, L.A. County is demonstrating the value of better supporting the full range of needs among those who are trying to reintegrate back into their communities. Awesome story – hope that there are updates about the successes and even the missteps and how they were overcome. Mass incarceration is the single biggest blight in our society and I hope to hear more about specific systemic changes that have a great impact on eradicating the lifelong sentence individuals receive as an outcast in our society beyond the their actual jail sentence. Thank You Casswell Goodman and Alex-Handrah for making this article . I hope that these programs will get sponsor. I know that there are many Re-entry citizen that will be waiting for these programs to get them back to life. Thank You and hope to hear from both soon.